In this paper we study the effects of high-tech capital, foreign direct investment flows and outsourcing on demand for labour differentiated by educational attainment levels in the manufacturing industries for two groups of countries over the period 1995-2004. These two groups of countries comprise Western and Eastern European countries respectively which are assumed to be differently affected by the European integration process. Using detailed trade data as a basis for measuring outsourcing we further distinguish the effects of trade and outsourcing on relative wages by different groups of partner countries. 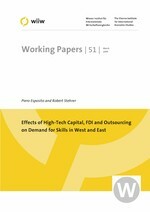 This allows to study the effects of 'inward' outsourcing and foreign direct investment flows to Central and Eastern European countries (which became quite important in this time) in the Western European countries and - conversely - to study the effects of 'outward' outsourcing and the increase in inward FDI stocks in the Central and Eastern European countries separately.